Drug smuggling is a huge, huge business. No matter what the authorities do, short of legalizing marijuana, will slow down the drug trade across the US/Mexico border. Even the 105-ton drug bust in Tijuana hasn’t slowed things down, as evidenced by the recent capture of 30 tons of marijuana being transported in an underground tunnel connecting Tijuana, Mexico, with San Diego, California. That’s right, an underground tunnel for the purpose of transporting drugs was discovered. The 600-yard tunnel featured ventilation shafts, a rail system, and even featured lights to make the transportation of drugs easier. 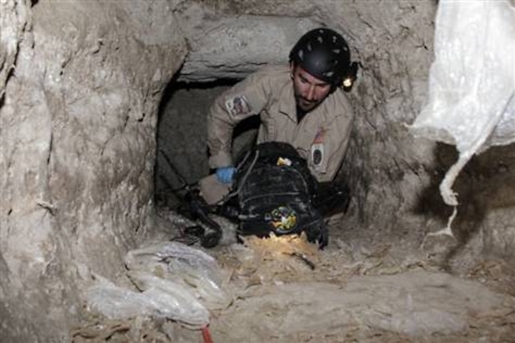 Even more impressively, rather than finding the tunnel abandoned (125 abandoned drug tunnels have been discovered since officials started keeping track in the 90’s), they found it in use by smugglers. Hence the 30 tons of pot found between the Tijuana home base and the Otay Mesa distribution warehouse. You have to give these people credit for their ingenuity. If they can’t go across the border, they’ll go under, around, or above it, either using tunnels, drug airplanes, or even drug submarines.